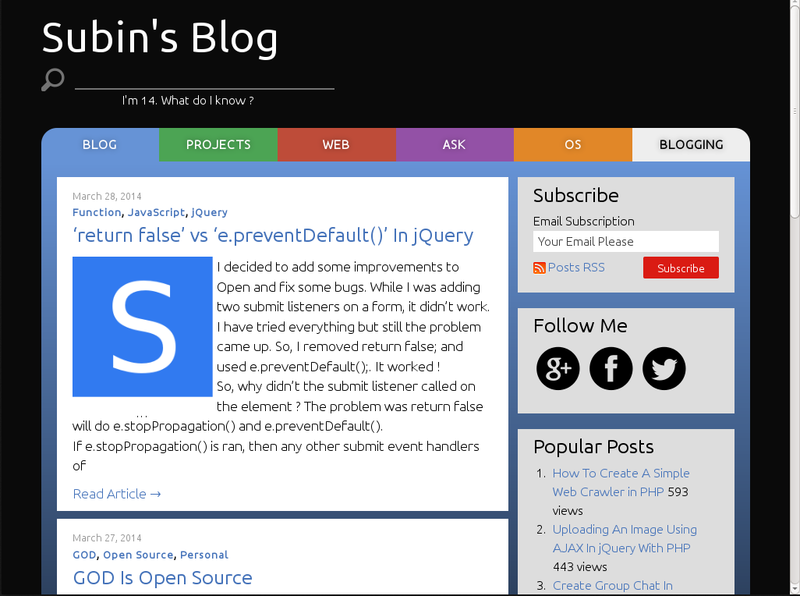 As you can see, I changed the theme of this blog with a new theme. If you have visited css-tricks.com, you can see there are similarities to it’s theme and mine. I really liked Chris Coyer’s theme and I contacted him to lend me the theme. But, no response. So, I decided that I should create my own theme. By WordPress Support forum, I found _s site. 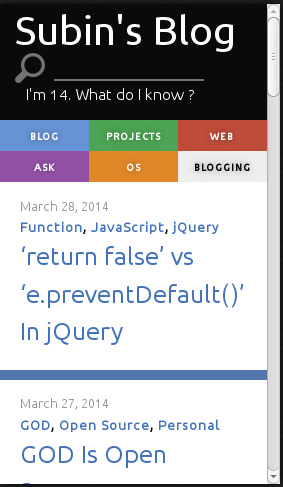 Underscores provide a starter theme for WordPress. It can be downloaded, make changes as we like. I downloaded it and made it in to this awesome theme. I’m calling this theme Subin’s Blog V1. The Navigation menu is mixed with colors and it has a drop down with the same color as that of the parent navigation link. The theme was created to be responsive to all screen sizes. I don’t have a smart phone, but when I resize the window it’s adapting to the screen size. Here are some screenshots of the theme in different screen resolutions. The theme was created to be light. 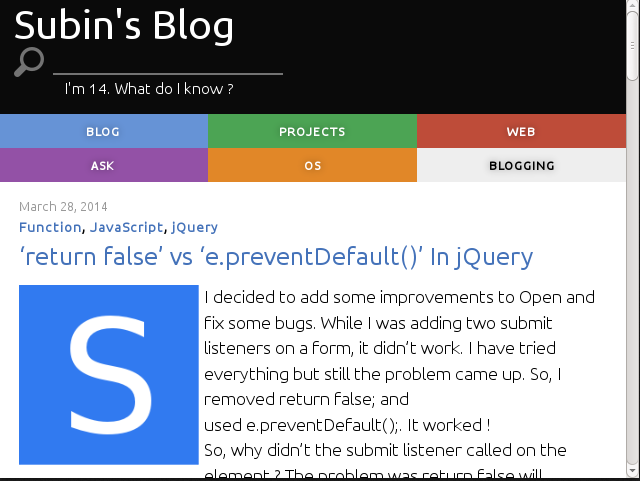 It has only 500 lines of CSS code which is served compressed in the blog. The whole theme is of size 85 KB and most of the files in the theme is not used. So the actual size of theme is less than 85 KB. The theme doesn’t cause any PHP errors as far as I tested. So, the error log is comparitevely small. Pages using the theme loads comparitevely fast. According to the test ran using Pingdom, page loads 98 % faster than all tested websites. You can see the full report here. I have tested the theme on different browsers. Almost all of the browsers give positive result as I expected. Firefox 9.0 didn’t render the site properly probably because it doesn’t support HTML 5. I haven’t tested this on IE. But, why should I ? Who uses IE anymore ?